Jared Unzipped: Trapped On Hold With Terrible Music! Trapped On Hold With Terrible Music! 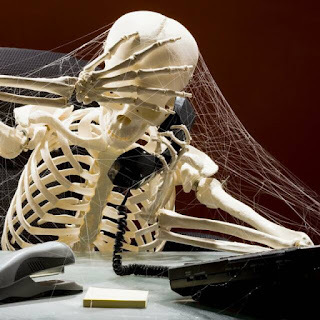 As I write my blog this evening, I'm trapped on hold waiting to speak via telephone with a customer service agent at a web hosting company with which I do business. It's been twenty-two minutes at the start of this article. While I don't mind waiting to speak with someone (I do realize that there are only so many agents to assist callers), I can't help be annoyed. Their hold music is driving me insane. Here's the gist of the tune that repeats over and over and over again. Loud group clap follow by "HEY!" Repeat. Repeat. Repeat. Repeat. Aaaaaah! This music is absolutely terrible. It makes me question why the company would even use it. Surely, they realize that long hold times for customers can raise their stress level. Yet, why antagonize customers even further with annoying, repetitive music? To alleviate the situation, couldn't some smooth jazz be played instead of this third-rate elevator music? Maybe the talents of Chuck Mangione, Mindi Abair or Keiko Matsui could soothe the nerves? Let jazz music fix the problem for you and calm all of the raging beast-mode customers during the long hold times. But noooooo... Woo woo woo woooooooo. How about woo woo up your arse?! Thirty minutes later... still on hold. I've heard this song dozens of times and its eating into my brain. Another idea has occurred to me. Why not play comedic audio plays while on hold? That way, at least the customer would have something to enjoy while waiting to speak with an agent. Heck, play old recordings of comedians for all I care. Just something to break up the monotony. Thanksgiving Eve On The Road. Liberals Must Admit Islamic Terrorism Exists. An Ode To The Duck. Most Humans Have Mobile Phones, But Not Toilets. Draw Something: Birthday Cake On Fire! Lost And Found In The Snow. Now We Can All Crap Shiny Glitter Poop. It's Time To Kill The Laugh Track. You're Getting Robbed At The Grocery Store. Draw Something: Leaf It All Behind! The War On Thanksgiving Has Begun. Gingerbread: Going Beyond The Cookie. How To Make Easy Homemade Hot Chocolate.